Arizona Roof Rescue » Blog » How To Protect Your Roof From the Arizona Haboob’s! Haboob season in Avondale, Arizona is no joke. With sideways rain, powerful winds, and damaging power, haboobs can be a scary situation for any home or business owner, especially if your roof is in need of a roof inspection or roof repair in Avondale. There are ways to protect your roof from haboobs, and Arizona Roof Rescue is a roofing contractor who can help you with the tough stuff. Most Arizonans know of haboobs and how dangerous they can be. A dust storm or haboob, which gets its name from the Arabic term habūb (“drafting/blasting”) is a type of powerful dust storm that is carried on a weather front. Haboobs aren’t reserved for the Sonoran desert alone. They occur in Texas, the Sahara desert, Iraq, North Africa, Australia, New Mexico, and California. Often occurring during monsoon season in Avondale, haboobs blow thick plumes of dust into cities and towns from the desert, usually accompanied by intense brief bursts of rainfall, lightning, thunder, intense destructive winds, and sometimes hail. Haboobs can become so bad that roofs can be blown off of buildings and trees and power poles can be knocked over. Haboobs, because of the upheaval of sand and silt, can cause eye and respiratory problems if one is stuck outside during a storm. Moving to shelter is always highly recommended during a dust storm. Scheduling a roof inspection, especially if it has been a long time since your last one, should be your first step in protecting your roof from a haboob. A roof inspection may seem like a needless expense, but refusing to do so could lead to even more expensive repairs in the future or the possibility of a dangerous situation during a haboob. Call a professional from Arizona Roof Rescue to properly inspect your roof for leaks, weaknesses, rotting tiles, and other possible problems. Warped and split shingles can often be repaired on the spot to protect your roof from a destructive haboob in the future. Because haboobs are accompanied by some pretty powerful and scary winds, tree branches can be ripped off and possibly damage your home. Preemptively trimming your unruly or extra long tree branches before haboob season hits, around spring or early summer, could be a lifesaver. While it is nice to have very large trees planted right up against your home or business to provide shade and lessen your utility bills in the hot Avondale summer, massive tree branches can become a damaging factor to your roof. If left unchecked, unruly tree branches could damage the shingles of your roof and leave it susceptible to water damage. The roof repairs needed after a roof is damaged by a tree could be very expensive. Taking care of those tree branches ahead of time is a quick and easy way to prevent roofing problems during haboob season. While it is rare for a building to be struck by lightning, the lightning that can occur during a haboob or monsoon is powerful and scary. If you want to put your mind at ease, consider purchasing a lightning rod and installing it on your roof. Lightning rods are designed to “catch” lightning that is directed at your roof and absorb the electricity of the lightning so it won’t cause serious damage to your roof and home. Water is your roof’s biggest enemy and causes a majority of damage that a roof can accumulate. After receiving a roof inspection and having warped Avondale tiles or cracked Avondale shingles repaired, your defense against water getting inside your roof and causing rot is pretty solid. However, you should still consider your gutters. When was the last time you cleaned them? Have you ever cleaned them? It may be time to get down and dirty and clean those gutters out. Clogged gutters can absolutely lead to flooding on your roof– if water cannot travel along and down your gutters due to clogging, where do you think all that water goes? That’s right, it floods your roof. It is easy to clean your gutters on your own, too. Put on some gloves, find a sturdy safe ladder, and pull out all the accumulate foliage and debri that has built up. Afterwards, be sure to use a hose to run water through your gutters and downspouts to make sure you didn’t miss a spot and water can flow freely through the gutter system. There are also relatively inexpensive gutter covers available that are easy to install and can prevent debris from building up and clogging your gutters. If your roof has be severely neglected or has been hiding some hard-to-notice damage, the integrity of your roof is probably dangerously weak. After getting a roof inspection, it may be time to have your roof completely repaired or totally replaced. If you’re thinking about putting it off, consider the fact that while roofs in great condition stand up against haboobs and storms better while already damaged roofs are at risk of falling into even worse disrepair. 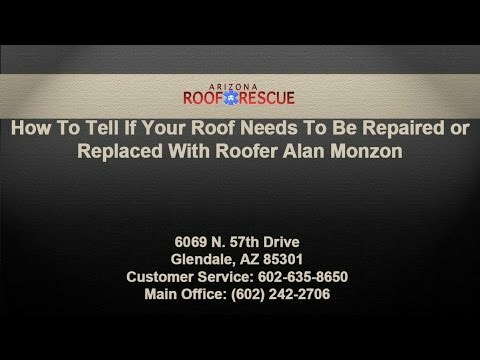 Arizona Roof Rescue is available to help you with repairs at an unbeatable price with excellent, professional service. Where can I find an Avondale roofing contractor to help me prepare my roof for haboob season? If you are in need of quality roof repair or roof inspection, look no further than Arizona Roof Rescue. We are a family owned and operated roofing contractor available locally in sunny Phoenix, Arizona. When haboob season hits and you’re concerned about the integrity of the roofing on your home or commercial building, we’re available to offer countless roofing services. We offer top-notch roofing services to the Valley. Give us a call or request an estimate from our website to get started on fixing up your roof today! Home » Blog » How To Protect Your Roof From the Arizona Haboob’s!